Wildcats head coach Sean Miller searches everywhere for recruits. But, he didn't have to go very far for his latest one. 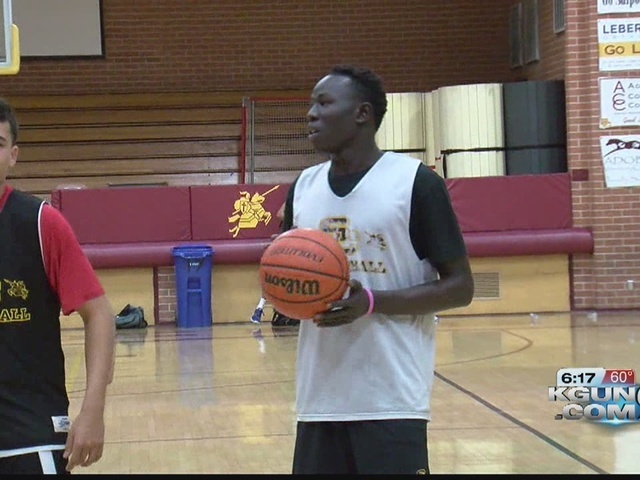 In this case, Salpointe's Majok Deng is quite far from his home in the South Sudan. The Wildcats have offered a scholarship to the 6'5'' sophomore wing player. Deng is a cousin of Lakers small forward Luol Deng. He arrived in America in 2011, and has become a sought after recruit. His other offers include one from former Wildcat Josh Pastner, who now coaches Georgia Tech. Deng is a Salpointe teammate of Cameron Miller, Sean Miller's son. Scout.com ranks him as the 11th best small forward in the country, and the top player at that position in the state of Arizona.